My article below appeared in the February issue of Hill Country Happenings.. Click here for more articles and information about happenings in the Texas Hill Country. Big changes came in my life at the conclusion of 2012. My husband, Rick, accepted a job back at DFW Airport. Although I was happy for him, his timing stunk! Strategic moves like scheduling the TV/Internet access required careful calculations since the move was in the final two weeks of the college bowl series and the post-season draft for my Fantasy Football League. Because Rick’s reporting to his job was immediate, I was faced with packing up things accumulated from our last move seven years ago. Prior to my hubby’s departure, I received the lecture of weeding out the “unnecessary items.” This proved to be an impossible task for this sports sentimentalist! Going through my sports memorabilia was like letting a child loose at FAO Schwarz with the grandparent’s credit card! Along with the keepsakes came the stories with them and the self-negotiation of what needed to be kept another ten years. 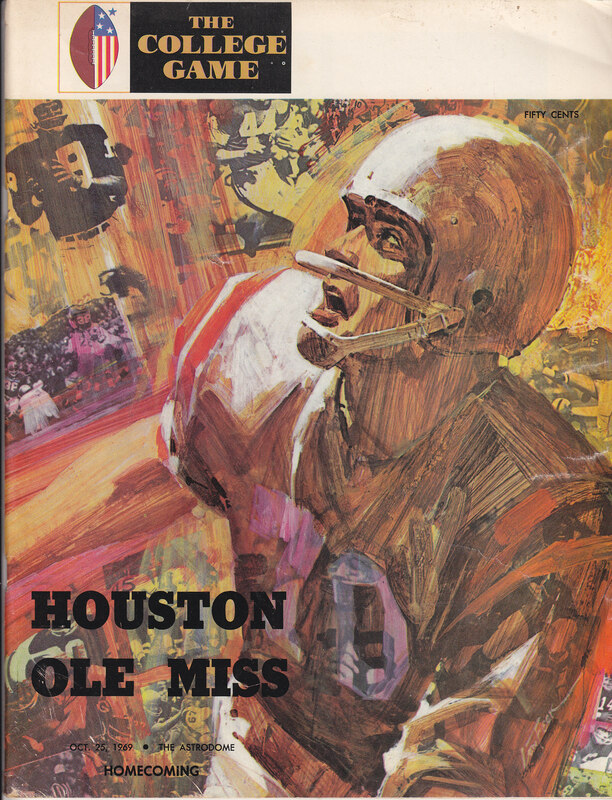 There was the University of Houston/Ole Miss Homecoming football program from October of 1969. The pages were pretty worn as I flipped through them. Once at the center, I perused through the player list. There it was — #18 for Ole Miss — Quarterback Archie Manning. I had an “ah-ha” moment when I realized Peyton had his daddy’s number. 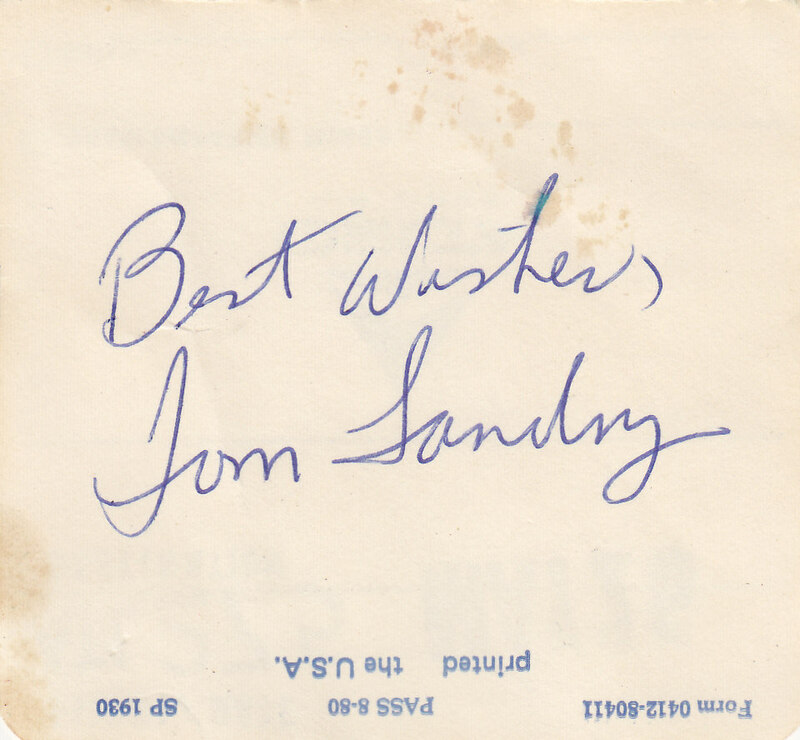 The next drawer contained a white coach Delta boarding card — on the back was Tom Laundry’s autograph. I thought back to the evening I met him. He was seated in an empty boarding area quietly reading a book. There was no doubt when I spotted the fedora — I knew the person who was wearing it. I was in awe of the man who commanded the likes of Roger Staubach, Dandy Don Meredith, Bob Lilly and Randy White. How sad that Jerry Jones’ first action when buying the Cowboys, was firing the legend. That was when I stopped being a Cowboys fan. That same year, there were two other Hall of Famers on my flights. The first was Paul Hornung coming from commentating at the Independence Bowl in Shreveport. He was wearing his Super Bowl ring. It was huge! Months later, I worked a flight out of Birmingham to Atlanta. Because of holding over Atlanta, the time seemed to be the equivalent of an international flight, but that was OK for me as one of my First Class passengers was Joe Namath also known to fans as Broadway Joe. I don’t remember how we even got on the subject of birthdays, but as he exited, he planted a kiss on my cheek and uttered, “Happy Birthday!” That was the last time I traveled without my camera!